The Wolves made their only trip to Erie Thursday evening to take on the Otters for an American Thanksgiving match-up. 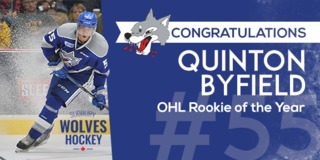 DARIAN PILON and MACAULEY CARSON scored the two goals for the Wolves in their 5-2 loss to the high-flying Erie Otters. The Wolves trailed 1-0 to the Erie Otters after 20 minutes of play. 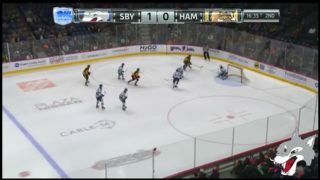 A scramble in front of ZACK BOWMAN ended with IVAN LODNIA putting the puck off of BOWMAN’s pads and into the back of the net. KYLE PETTIT and JORDAN SAMBROOK were credited with assists on the play. BOWMAN made a great save on DYLAN STROME at the end of the period to keep the game at 1-0. Shots on goal at the end of the first were 15-3 Otters. The Wolves left behind their first-period-selves and came out with a bite in the second. 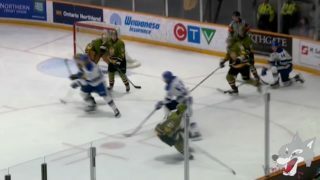 A stretch pass from OWEN LALONDE to DARIAN PILON resulted in the Wolves’ first goal of the game. PILON was ahead of the play and went in alone on Otter’s netminder TROY TIMPANO making no mistake as he put the puck past the goaltender. The refs went upstairs on the play to make sure that PILON was not offside but announced it as a good goal. Three minutes later T.J. FERGUS beat BOWMAN to make it 3-1. After 40 minutes, the Wolves trailed on the shot clock 25-10. Early in the third, MACAULEY CARSON scored to bring the Wolves within one, however the Otters answered back less than a minute later on a goal by ALEX DEBRINCAT to make it 4-2. The Otters went on to add an empty net goal late in the third to take the game by a 5-2 final. Final shots on goal were 39 to 16 in favour of the Otters. 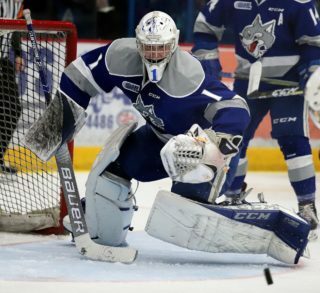 The Sudbury Wolves will return home Sunday to close out their busy weekend when they host their Central division rival, the Niagara Icedogs, at the Sudbury Community Arena. Puck drop is 2:00pm! 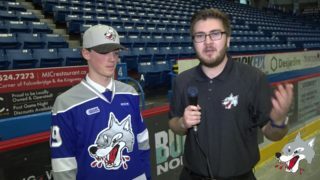 The Sudbury Wolves will welcome back Glencore and special guests of Fraser Mine for this Sunday afternoon match-up. 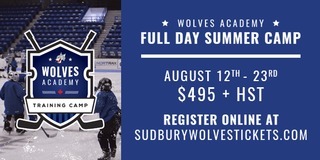 To purchase tickets, visit the Sudbury Arena Box Office, call 705-671-3000 or visit greatersudbury.ca/tickets.